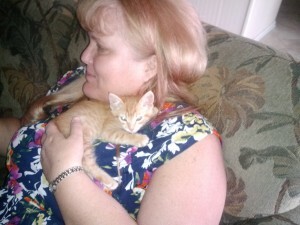 I am sure all you cat and animal lovers out there wouldn’t mind a kitten update and I am happy to provide it. Both kittens are eating like pigs and have been tested and have no parasites. The flea problem is going away and both are bright eyed and bushytailed, even the little guy with the broken leg. The day after we went to the vet the little broken black kitty had a complete change in personality. It was like he knew were on his side. He now purrs just at the sight of us, loves having his chin scratched, and is all around adorable and no longer feral at all. The orange kitty has been slower to come around. He is better, but still hisses sometimes. This weekend my college friend Barb was visiting from out of town. Barb is a cat whisperer. She held the orange kitty for me while I cleaned the carrier. She draped him over the front of her neck and rubbed him and he actually just stretched out and fell asleep. The rest of us were walking around, leaning down to look at him, and he just ignored us all. It was quite the change. But Barb went home early this morning and he may not be quite so good for us as we are not the cat whisperer that she is. Meanwhile, we think we know how the little black guy broke his leg. He is quite the adventuresome little guy! While his brother slept on Barb, our friend Sue babysat little black kitty. He was trying to get away and explore almost the whole time. Sue finally has to sit on the floor after he tried to jump out of her arms. As one point, completely unexpectedly, the little guy with the broken leg leapt from the floor on one side of Sue’s leg to the other. Over her leg, never touching it! With a broken leg! Amazing! But I think he used up a life or two with whatever move broke his leg. Note how blurry he is in the photo below. That is because he wouldn’t stop moving! 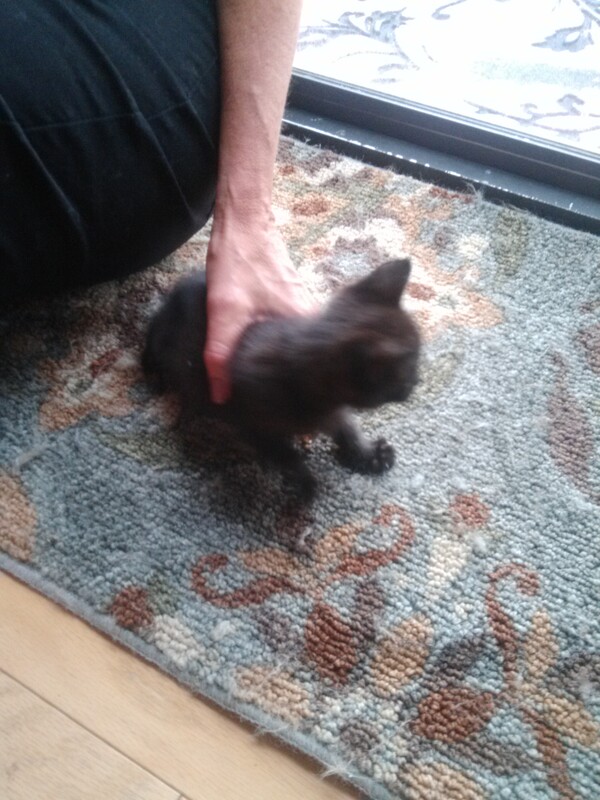 As I mentioned a couple of days ago, we have taken in two adorable feral kittens. I decided they needed to go to the vet yesterday. One of them seemed to have the runs (although I wasn’t sure which one) and both had terrible fleas, which can cause anemia. So Eldest Daughter and I took them in. I could take two little kittens by myself, but misery loves company so I made her go along. The kittens were weighed. The orange one weighs 1.3 lbs. The little black one weighs just 14 ounces. Happily neither one had a temperature. Then the lovely and wonderful Dr. B came in to give the kittens a quick exam. She estimated that they were 4-5 weeks old. The black one was so much smaller than the orange one that she pondered for a moment if they were from different litters. But they were obviously bonded to each other so she decided the little black guy must have been the runt of the litter. But, then she found what could have been the cause of his stunted growth – the back left leg of the black kitten was broken! Oh no! A quick x-ray showed a very bad break. The femur is broken and the ends are no where near each other and completely offset. Surgery would be required to put pins in to pull the ends together. The x-ray showed remodeling which indicates that this tiny kitten has been dealing with a broken leg most of his very short life. In spite of this bad break, the little guy still hobbles around on the leg. He was scrambling around pretty good when we were trying to catch them. But when I think of the pain he must be dealing with, it breaks my heart. How could we possibly not try to save this cute little guy? Note his poor leg hanging down. The kitten needs to get healthier first, so surgery is scheduled in a week, if things go well. We are soft hearted crazy people. This is why we try to keep ourselves out of these kinds of situations. But sometimes animals find us no matter how much we try to keep away. If I thought I was running a pet care facility before, I really am now. You should see me juggling the dietary needs and medicines of four needy animals, one of which still hisses at me when every I come near. Folks, life is like a river, you never know which way it will turn! We should have known our fate was sealed a few days ago when Hubby and I got out of our car in the driveway and heard the distinctive “mew” of a small kitten somewhere in the neighborhood. Hubby and I looked at each other and then made a run for the house. Two days ago, I was getting something out of the shed in our side yard when I heard some weird noises and scuffling. I couldn’t see anything, though, and I went on watering my plants. Last night I told hubby that we either had a small animal or an alien in the side yard. He ignored me. Oh no. We have coyotes. We couldn’t leave a kitten out in the wild to face that. But we had an even bigger problem. The kitten ran into the side yard when Hubby spotted it. The side yard where Honey takes her constitutionals. And, to be honest, Honey is a wonderful dog in many ways but she doesn’t cotton to small animals and the kitten wasn’t any safer with Honey than the coyotes. We put food and water out for the poor thing and went inside. Hubby went out again a little while later and found the food bowl licked clean and not one but TWO tiny kittens huddled together. Double OH NO! Our efforts to cath then were unsuccessful as they ran behind the shed or under things. We went back inside and got more food for them. A half hour later, which was 10:30 by this point, we went out again. But this time they heard us coming and all we saw was the tail of one as it disappeared behind the shed. It just so happens that the previous owners had left two pieces of plastic pipe behind the shed, big enough for a kitten to crawl into. As I shined the light behind the shed I saw the one kitten go into the top piece of pipe. Well, we decided at least that was one we could catch. Hubby tilted and pulled the pipe out. It was just short enough that he could put a hand on either end to cover the holes. Since he could feel fur on both hands he knew he had both kittens. Yay! He carefully maneuvered the pipe into the garage and shook the kittens down to one end of the pipe, which was inserted into a cat carrier. I reached in and carefully pulled first one and then the other kitten out into the carrier. We took the carrier out to the shop, where the kittens and us wouldn’t have to worry about Blackie and Honey. We had already fed them twice so we just put a bowl of water into the carrier and turned off the light and left them be. Unfortunately the kittens are feral, but from what we read on-line we should be able to socialize them, they are so young. A friend let me borrow a larger cat carrier so they can have a bit more room between them and the litter box. 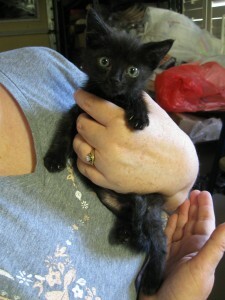 We hope to make them into good little pet kitties in the next few weeks so we can find them good homes. Just what I needed, kittens! Sorry I don’t have a photo to show you the cute black kitten and orange tiger stripe kitten, but I figured they had enough on their plate. They didn’t need a camera flashing in their eyes while they huddled in the back of the carrier. It was very hot last week. So for Father’s Day we headed for the coast, which is Hubby’s very favorite place to go. It was a cool and pleasant 75 degrees in Huntington Beach. We arrived just about noon and had no trouble finding a parking place in the public garage which can be accessed from Olive or Walnut, right off of Main. The cost is $1.00 for every 20 minutes. We were there for 3 hours so it cost us $10 to park, which, for the convenience, we thought was reasonable. There is on street parking, but we didn’t want to waste our time trying to find one of those. We walked down Main Street, which leads to the pier. After two devastating storms in the 1980s, the pier was rebuilt in 1992. It is the longest concrete municipal pier in the United States. 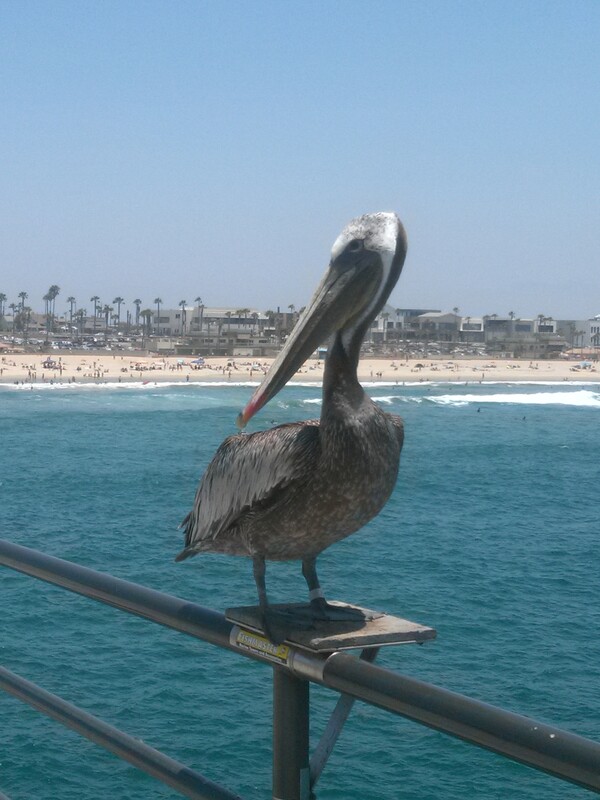 You can always find a pelican or two on the pier, just waiting to get their photo taken, but they don’t like it if you get too close. 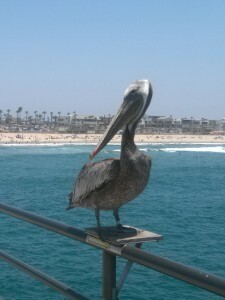 Watching the surfers from the pier is great fun and there were lots of them out in the water yesterday. There are lots of places to eat on Main Street, but, for some reason, we always seem to end up at BJ’s. Today was no exception. We shared a pizza and Hubby had a beer in honor of Father’s Day and the fact that I already told him I would drive home. After lunch we went to the International Surfing Museum. It is a small place that asks for just $2.00 a person as the entrance fee. It was fun to spend a half hour in there, looking at the exhibits, watching a video, and buying some postcards. It is located at 411 Olive Avenue, less than a block from Main Street. They are getting ready to build a new museum nearby. An artist’s rendering is near the entrance so you can see what it will look like. We were told ground should be breaking for it in three years. After stopping to get a nice cold coffee drink, we sat on a bench for a few minutes and watched the cars go by. Then it was off for home again where it was only 90 degrees at 4 in the afternoon, thank goodness. Summer has finally arrived in So Cal. We have had a week of temps that have stayed very close to 100. After the long drawn out unseasonable wet and cool spring, this abrupt change has taken some getting used to. I am furiously cleaning the house today due to finding out that we are having a house guest Sunday night. I just found this out yesterday. It is a friend of Youngest Daughter’s and I am sure she won’t do the white glove test. At the same time, swabbing the kitchen floor, getting up the dog hair, and cleaning the bathroom is necessary. Hubby was out of the house trying to deal with the Evil Empire (AKA Bank of America) so the girls and I put on ABBA to do housework to. ABBA music is really good for that sort of thing. A good beat, peppy…I highly recommend it! The June weather and housework come together in my mind because the two combined are making me sweat up a storm! We had a bit of a brew ha ha in the house last night at 3 am. I heard the dog get up, which she does at least once a night to get a drink of water. But this time she gave herself a good shake, which usually means “Good Morning, I am up!” When I rolled over and saw it was 3 am I decided that she would just need to deal with it. Of course, since I was awake I had to go to the bathroom. I could see through the bathroom window the light was on in Eldest Daughter’s room. That is where Honey sleeps now. When I asked this morning I found out that Honey had gotten up in the middle of the night and had wandered around the bedroom, gotten herself tangled up on a plastic bag, and had passed a little gas along the way. Eldest was afraid our elderly dog had pooped during the plastic bag incident and turned on her light to investigate. By then Honey was back on her bed looking all innocent. But the light had caused her to get up, go in the hallway and give a good shake. That was when I woke up. Oh, the joy of pets! We are off late this afternoon to a friend’s house to celebrate a 60th birthday. Tomorrow we will celebrate Father’s Day. I hope you are having a good weekend! As I mentioned in a post a while back, somehow forks, spoons and knives from my service for eight have disappeared. I am still puzzled how this happened, but the result is that what was a service for eight when we married 29 years ago is now, at best, a service for five. One dinner for the four of us and we are SOL until the dishwasher has run again. When it comes to things like flatware, dishes, and glassware, I like full sets. I am not going to my local Wal-Mart and buy three forks, four spoons, and a couple of butter knives and throw them in the drawer with the existing flatware. If you do this, I am not judging. But for me, I figure I am 53 years old and I deserve matching flatware. Finding new flatware was full of problems. Number one is that Hubby doesn’t like it when things change. Number two, flatware nowadays is GIGANTIC. You could slay an elk with the huge dinner forks that come with most sets. The soup spoons look like serving spoons! Also, I am, ahem, cheap, and don’t want to spend $200 on a new set if the forks are just going to walk away again. I went on the hunt and found a set I liked, with normal sized forks and spoons. It is by Oneida and called “Sand Dune.” My husband called me out on the name. I admit I like anything that hints of the beach, but, really, I liked the flatware in any case. I found it for a reasonable price online and it just arrived the other day. Twelve places settings! Take that, you flatware black hole! We can lose a few and still have service for eight!!! Wash as soon as possible after each meal. When hand washing, dry promptly. Never allow it to soak, even in plain water. Never allow it to sit unwashed over night. Given that the cheap, no name stainless lasted us for 29 years under all the harsh conditions listed above, I think the Oneida will survive. “Never allow it to sit unwashed over night.” Giggle….. Sometimes you just have no choice but to do adult kinds of things. This is one of those weeks were Hubby and I are getting adult things done. The first was accomplished Tuesday. Hubby and I finished getting our “estate plan” in place. Oh boy! Nothing feels more adult than talking about what should happen when you die, signing wills, and, even better, signing something called an “advanced health care directive.” Checking a box next to “pull the plug, don’t let me linger” is a sobering experience. Yesterday we placed Mom in Law in the niche we selected for her at the cemetery where Dad in Law is also buried. This took a very long time primarily because the cemetery was very hard to work with. Given what we have had to deal with, I guess with shouldn’t have been shocked when we arrived and discovered that the plaque that goes over her niche had the wrong birth year. We requested to see a proof before they ordered the plaque, as we anticipated something like this. That never happened. So, of course, there was a mistake. We should have taken bets. However, we put that aside and had a nice moment, just the four of us with Grandmama, as it was so many times through the years. Eldest read a bible verse and Youngest read a poem. I said a prayer and Hubby gently placed his mom in her final resting place. We then went over and visited Dad in Law’s grave and thought some good thoughts about him. Like I said, an adult kind of week. However, sometimes we have to get these adult kinds of things done, so Hubby and I are feeling good that we got some important things done this week. How is your week going? Are you having to be an adult? I remember my college graduation as marking the moment I was finally DONE! I think Youngest Daughter felt the same way Saturday. I, on the other hand, remember when she started kindergarten, so my great joy and pride for her achievement was tinged with nostalgia, as I mentioned a few days ago. So I shed some tears, as this mom often does at significant moments such as college graduation. I cried when the graduates marched in, I cried when they sang the national anthem, and then I cried just a bit more for no good reason. But then I was OK.
During the two hour ceremony, Eldest Daughter took the time to figure out how many woman were in the 2015 class of mechanical engineering graduates. Drum roll please….13! That is 13 out of a class of a little more than 200. That makes me even prouder, that Youngest is taking a path that so few women take. She hopes to be an inspiration to other young women who may not think that they can pursue engineering. I think she will be. 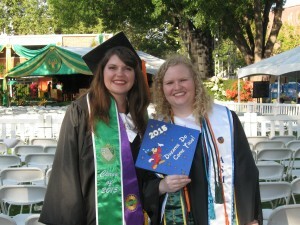 Here are a few pictures we took at graduation. 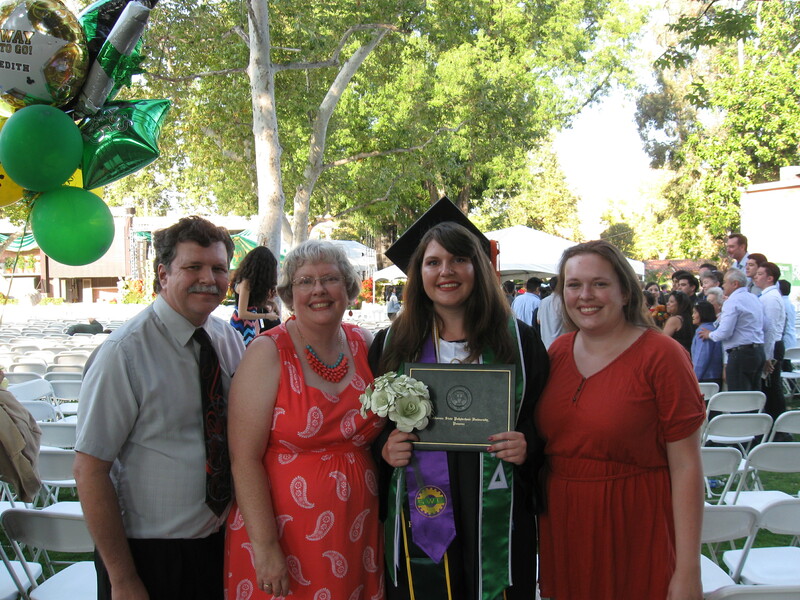 Here is the whole family with the happy graduate. I am wearing the outfit I bought the night before, after I was told I had to dress up for the event. 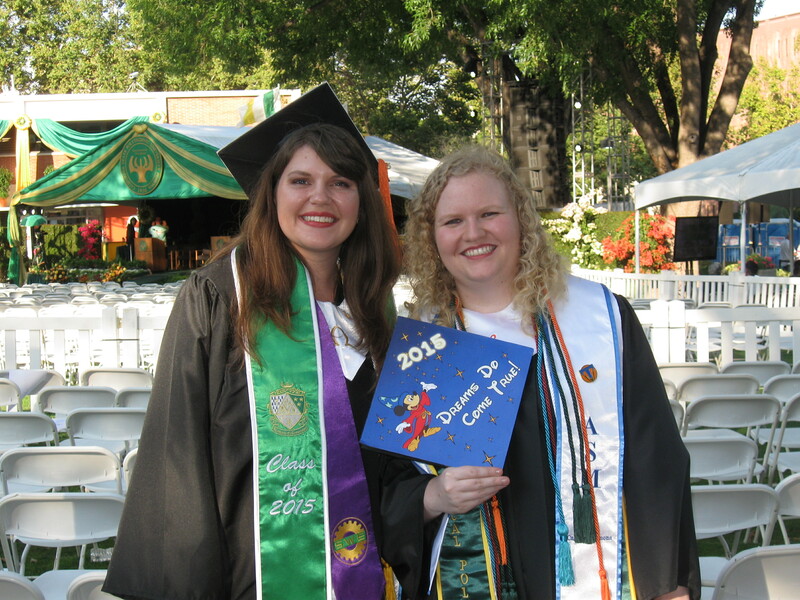 Here is the happy graduate with her roommate for the past two years, Melissa. Note the blond hair. Thank goodness for that blond hair. Whenever we spotted it we knew Youngest was nearby! BTW, Melissa’s dream has been to work in the Imagineering department for Disney. Happily, she was just hired by them, which is why she put “Dreams do come true” and Mickey on her cap. This is what the top of Youngest’s cap looked like. 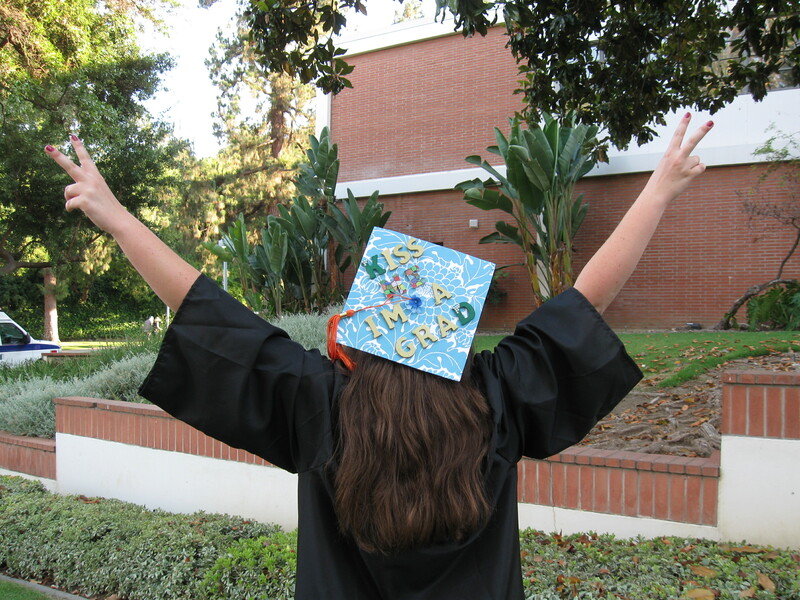 Her sorority has a tradition of the little sister decorating the big sister’s hat when they graduate. 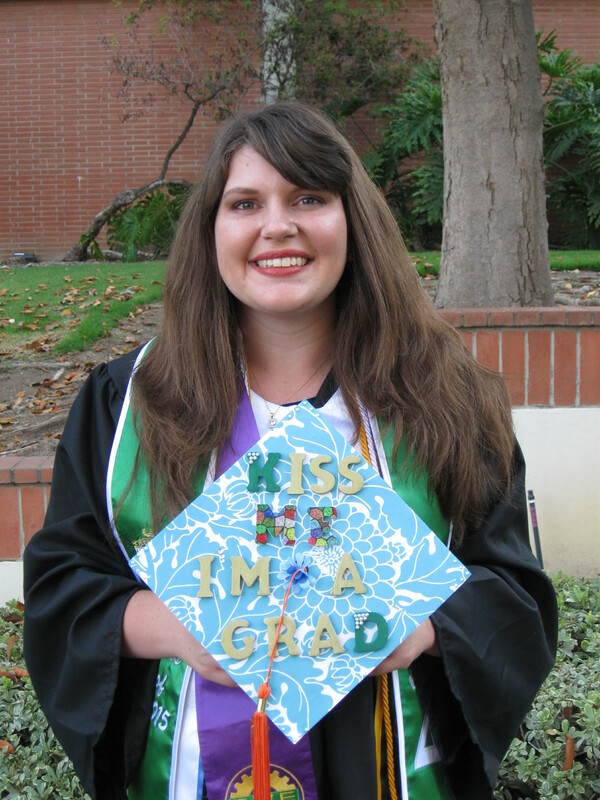 It says “Kiss Me I’m a Grad.” Note the “K” and “D” are different colors. That represents their sorority, Kappa Delta. Then the word ”ME” is a different color, representing Youngest’s major, mechanical engineering. Her little sister was so clever! I want to commend Cal Poly, Pomona for a lovely but fast paced graduation. It was appreciated by all of us in the audience! Today I participated in the Tub Parade. That is the day that parents drive to the university where their offspring have been studying their life away for nine months to pack up plastic tubs full of stuff to bring back home. Youngest daughter had big plastic tubs and so did all of her roommates. When I was carting stuff to the car I saw kids and parents all over toting empty plastic tubs into apartments and full ones back out. It was a regular parade! These last five years have been fun. While we missed Youngest when she was at school, she was only 35 minutes from home or 20 minutes from Hubby’s work. We would go have lunch with her. She would indulge my love of Home Goods and let me drag her there after lunch. We would check out the Farm Store on campus and all their fresh produce and plants. She would fill us in on all the happenings in her life as a college student and introduce us to new restaurants she had found in the area. It has been fun. It is weird and sad that it is over. Don’t get me wrong, I am happy for Youngest that she has finished. Good for her! But I am nostalgic thinking back over the last five years. That was almost a tenth of my life! I am also getting all teary eyed about my little girl getting older. My, time does fly! I came home and stress ate a piece of cheese cake and some BBQ potato chips. Then I called a bunch of friends and chatted about goings on around my city. Now I am going to go shopping. The three key things a woman under stress needs – junk food, friends, and new clothes! The thing I like most of all about reading blogs is the peek I get into other people’s lives. Face it, I think most of us like that chance to be a fly on the wall and see what is going on in the world of other human beings. I admit I do. The happy thing is that, by reading blogs, I can do this in a completely legal and above board manner! Through blogging I can enter the world of the mom and grandma in austrailia, the cat lover in Pennsylvania, the Morman mom and burn survier from Utah, the woman who lives on a giant cattle ranch in Oklahoma….and on and on and on. One of the most unusual blogs I follow went silent for two years. This isn’t unheard of. A number of blogs I follow have fallen off the face of the earth at some point. After all, for most folks blogging is a hobby and hobbies often get pushed aside for real life. Happily, this blog, called “Happiest Baby in the World,” has recently come back online. The blog follows the adventures of Nathan and Meghan and their daughter Dee as they travel back and forth between the United States and China. Nathan and Meghan are conservation biologists who specialize in giant pandas. Dee just comes along for the ride, rocking her red hair and getting all kinds of attention in China. Reading about their experiences, especially when they are living in China, is a fascinating glimpse into a world that is completely different from the one I experience here in So Cal. Of course, these people are complete strangers. But I have seen their wedding photos, their little baby, and read so much about their lives over the years I would invite them over to dinner in a heart beat. They, of course, would think I was stalking them, so I better not. If you decide to visit Happiest Baby in the World today, you will be jumping in to a multipart series about how Nathan became an accidental kindergarten teacher in China. Below is the link for the first post of that series. BTW, Nathan and Meghan didn’t give me so much as a panda sticker for mentioning their blog. As a matter of fact, I feel very confident when I say they have no clue who I am. I just like their blog!